One of our all-time favourite colour combinations is blush pink and grey. 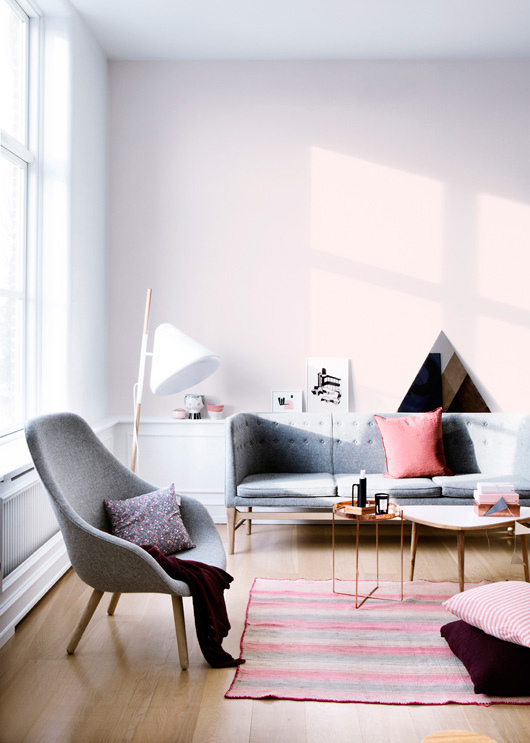 With no signs of this on-trend colour palette slowing down, we’ve curated 5 different ways to pull off a blush pink and grey living room. This colour palette lends itself well to the Scandinavian style. 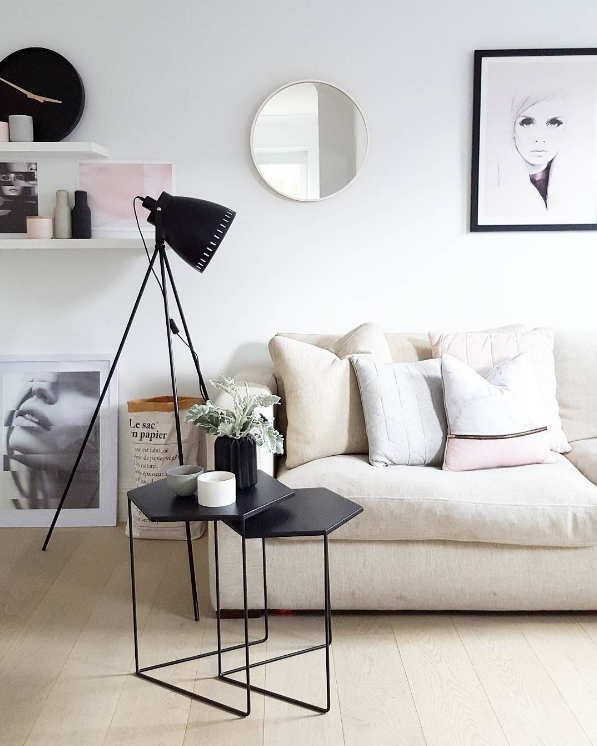 In this living room Katy Thomas of The Eye Spy Milkbar has achieved the look using Nordic wall prints, clean line decor such as the mirror and clock, and iconic design shapes such as the lamp and side tables. Adding a rich tone, like deep mauve, can take this look from pretty and romantic into a more sophisticated direction. You may have heard us talk about the 60-30-10 ration before — it’s an easy rule to follow when bringing colour into your home, making 60% of the space one colour, 30% another colour and 10% an accent colour. In this living room, the 10% accent is the rich mauve, the 30% is a mid-grey and the 60% is a barely-there-blush-pink. And here is another take on the look, with the rich tone taking more of a front seat and only subtle hints of grey. The addition of black really makes the colour palette pop. Another way to interpret this trend in a more design forward way is to use the colours in blocks. 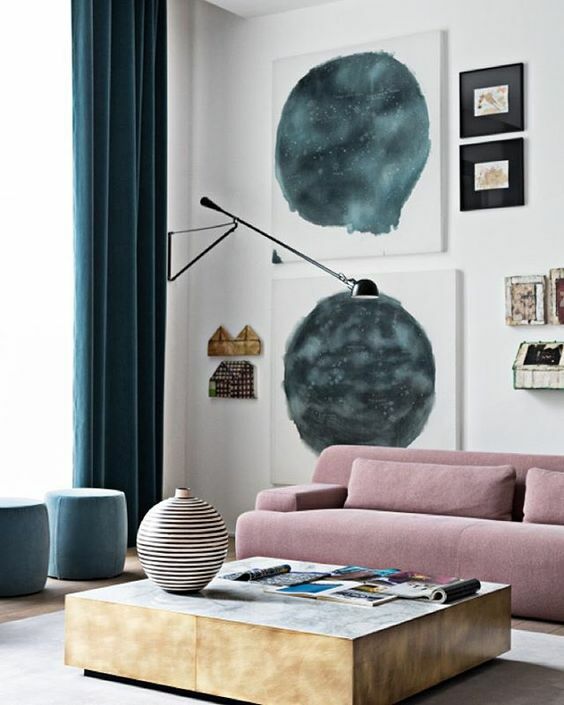 Oversized artworks in grey against the designer sofa in a dusty blush pink create a luxurious vibe. The brass tones on the coffee table and blue velvets further enhance the luxe feel. 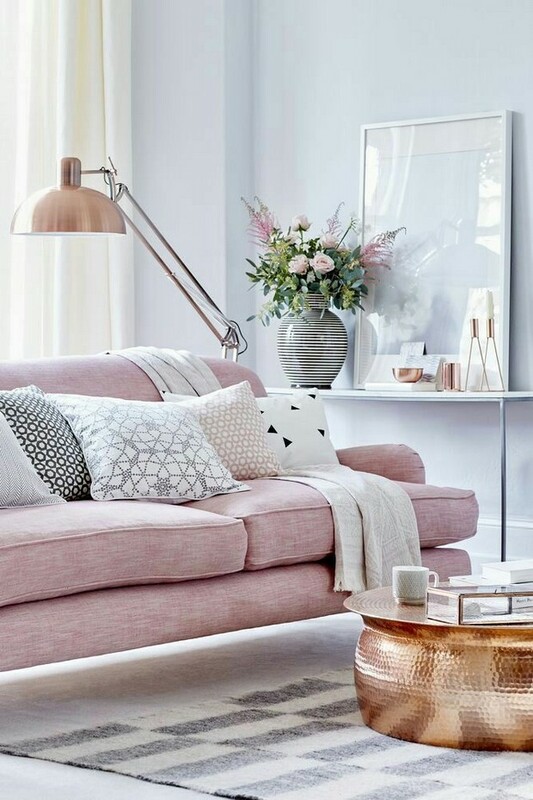 Blush pink and grey work well with a range of metallic accents such as gold, copper and brass. Consider making the 10% accent a metallic, for example in this living room the copper lamp, coffee table and accessories on the console bring the space together. Brass has taken over copper as the top trending metallic but feel free to break away from trends and go with what you love most! The final look uses neutrals like timber and white to balance the blush pink colour. How gorgeous is this blush pink rug by the way?!! Want. It. Now. Are you obsessed with blush pink too? 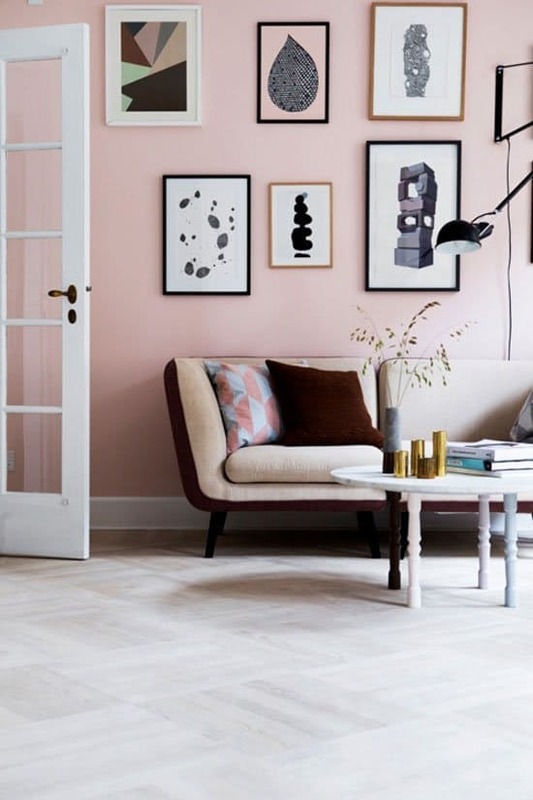 Have you introduced blush pink in a different way in your home? 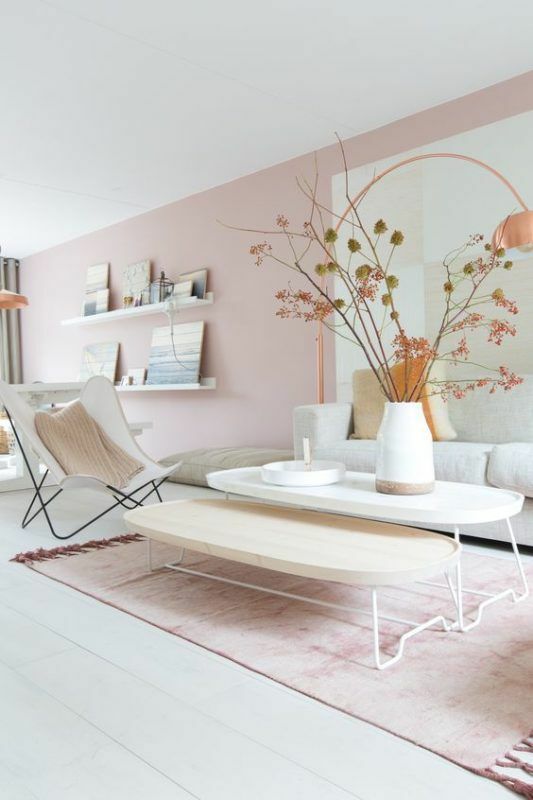 The blush pink rug is indeed gorgeous! Among the designs, my best pick is the last one. Everything looks gorgeous actually but that last design is so me. It appeals to me more than the first five designs.